Hey mates!! It's finally Wednesday, the week is half over. WOOHOO! There is a new officer at my husbands job, who my husband thinks it a really great guy. He is from Australia and has lived in the states for a few years. Of course my husband was telling him how madly in love I am with pavlova and he mentioned his favorite dessert was "Vanilla Slice" and how I should try to make it. He also said it was like this iconic Australian dessert and I was devastated! What about my heavenly PAVLOVA?!!? Anyway, he said he hadn't had it for years and being the kind, loving, generous woman I am (shut up, I AM) I took that on as a challenge. I was presented with a few obstacles with this however. When I looked up the recipe, it seemed rather easy except for this whole "thickened cream" issue. I know about thickened cream because of a YouTube channel I watch (holla, David) and he is from Australia. I did a little research and watched back an old video or 2 and felt it was OK to go with just heavy cream since I can not purchase thickened cream here. Also I could not find custard powder, BUT, by way of my faithful foodie readers, I learned I could make it myself. Thank God for them, because I obviously forgot how to use Google! Thanks guys, really! So I had to tweak this recipe a bit, I also put the ingredients into American terms, even though you could likely figure it out, some might not and I just wanted it to be clear. This is one recipe I would measure everything out first and have it ready to go. This custard moves so fast you won't have time to stop whisking so measure it all out and get your head in the game! This will come out with a beautiful top and bottom "crust" and a thick, firm custard center. 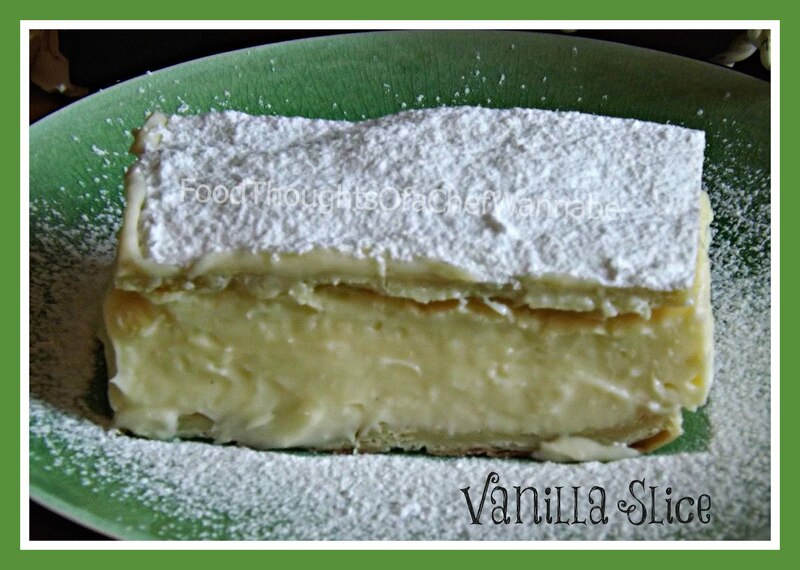 This isn't an overly sweet dessert, however, it is pure vanilla perfection! Thaw your puff pastry in the refrigerator. When it is thawed, unfold each and put on a parchment lined cookie sheet. Bake at 410 F for 8-10 minutes. Remove and set aside to cool. In a medium pot combine, cornstarch, sugar, and the milk you heated. If you used a vanilla bean strain it first. Add in heavy cream and bring back up to a boil, whisking constantly. Did you hear that? CONSTANTLY. This puppy will go from nothing to fried in a New York minute! When it is thickened, add in egg yolks one at a time whisking like a banchee! Then add in butter and vanilla. Place a strip of parchment or foil into the bottom of a 9x9 square baking dish. You want it long so you can lift the slice out when it is done for cutting and serving. Place one of your puff pastry sheets firmly into the bottom. You will likely need to trim it, but you want it to fit perfectly down into the bottom of the dish. Add your custard mixture on top and smooth out evenly. Then trim the second puff pastry sheet and place firmly on top. Give it a little push down. Cover tightly and refrigerate overnight! Dust heavily with powdered sugar before serving! This is so light and refreshing! You will love it! Make sure to let it sit overnight, that is important!!! Plan ahead! Wow! This recipe is incredible...and happens to be one of my favorite desserts. I will def. be trying this one out. In Montenegro we call this Krem Pita, and yes, it is delicious! Oh my gosh...I love custard! I don't care WHAT country it comes from! Thanks for sharing it at Wicked Good Wednesdays! Thank you for sharing!!!! This recipe for the vanilla is very much like the one I use for my cream puffs! LOVE this recipe and will definitely be making it! Cool! In Norway we call these Napoleons Cake. Looks almost identical, though when cook abit differently, we just mix whipped cream with thick custard (often bought), add a bit of cooled gelatinmix into the custard. We cook the sheets first, and assemble this afterwards, and cool in fridge for a few hours. Heavenly! I made this last night. Came out beautifully and delicious. But is the custard supposed to be so thick? I'm thinking I'll use less constarch next time. I followed your directions to a tee. Constantly stirring. Yes it is! That is how it holds its shape as well. I can only go by what I am told, and I was told it was perfection by Mr. Aussie!! I don't see any reason you can't change it up to how YOU like it though!! Thanks for reading and commenting!